Unity is now the default shell interface used in Ubuntu 11.04, so Gnome is no more the default desktop on Ubuntu, but its applications are there. 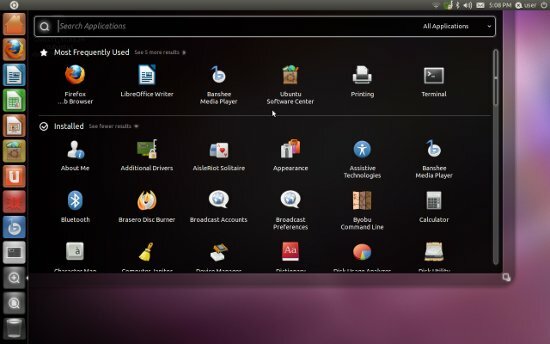 If you are using Ubuntu 10.10 (Maverick Meerkat) or 10.04 (Lucid Lynx), then you may want to try Unity Desktop (shell). Unity has a lot of new and exciting features- so you must give it a try, if you don’t like it, then just come back to your favorite desktop – Gnome (2.3 or 3.0, Try Gnome 3 on Ubuntu 10.10-10.04) or KDE. Unity has a nice left panel bar, a launcher for your favorite Apps. Unity was first shipped with the Notebook edition (Now, desktop and notebook edition has been merged together, in version 11.04) of Ubuntu. If you are using Ubuntu 10.10/10.04 for experimental purpose, then you can also try Ubuntu 11.04; on the other hand, just install Unity , with existing desktops like Gnome 2.3 or 3.0 or KDE. This post will explain, how to install Unity shell on Ubuntu 10.10 / 10.04 from command line (Don’t be panic, it’s a simple command, you just need to copy the command from this post and paste in terminal) /Shell. Open Terminal (Hit CTRL+ALT+T) and type the following command(s), (followed by your login password; then enter yes, when you get an confirmation message). That’s All..Now, logout from the current session and select Unity desktop/shell at login prompt, and login again. Enjoy ..ubuntu with Unity..Let me know if you got any error while installing Unity, through comments. This is not exactly true. What you will get instead is the Netbook Edition interface. There is currently no PPA to install the exact Unity interface available on Natty Narwhal to either Meerkat or Lynx short of upgrading the whole system to version11.04. If feeling ‘adventurous’ get only the source code for the packages used by Unity, compile it for Meerkat or Lynx and that may work considering that 11.04 is still on Gnome 2. Yeah!..you are Right Markya ..actually it is the initial version of unity – that we got with Netbook Edition .. Trying to install it, I got an error E: Couldn’t find package unity. I have Ubuntu 10.04 32bit desktop. Unity is just a shell which lays on top of Gnome. Yes, it is a bit slower since you’re running components from both, but there is nothing some fine-tuning won’t do. It will get better in time. Just look at how far Compiz has come in the past 4 years! Don’t give up on Unity so soon. The only thing keeping me on Ubuntu and Unity is the stable dock and its crash-handling logic. I’m also pro-Gnome because I can’t stand KDE. KDE makes me want to never touch a GUI-driven Linux distro again. It feels so much like OS X with the new shell. I personally like it a lot, but I wish the kernel was as efficient with resources as OS X. The only problem I’ve had since installing it was getting the latest Nvidia driver to install and run. I had to load the Xorg backup file and reinstall the Ubuntu supported drivers through Synaptic. I’d prefer a bleeding-edge driver from Nvidia and do disagree with the lack of direct support. Oh, and I had to replace Banshee with Rythmbox after Banshee decided to stop playing anything. Unreal 2004 works (after hunting down some libraries and sym-linking one file to battle ALSA’s stubborn ways), Quake 4 works, and Doom 3 works. I’m still working on getting UT99 GOTY to install. I had all of that working easily, out-of-the-box, within a single restart and less than 24 hours. Ubuntu has progressed more than any other Linux OS I’ve followed in the past 5 years, and it’s contributed the most feedback to Linux. I’m extremely happy to be able to use this software for free.